A pilot fesses up to a dumb mistake in hopes it might help others avoid even more costly ones. While I may be a relatively experienced pilot, that doesn’t mean I know everything and can’t make mistakes. No pilot is ever that good. One of the things that I have always tried to do is to be willing to share when I mess up if others can learn from it. Sometimes this can be embarrassing, but a little humble pie can be a good thing for all of us sometimes. One such lesson is that a little complacency can quickly trump any experience we may have, even if you haven’t left the ground. On a flight in our Stinson en route to a practical test I was going to be giving, I noticed a little engine roughness. 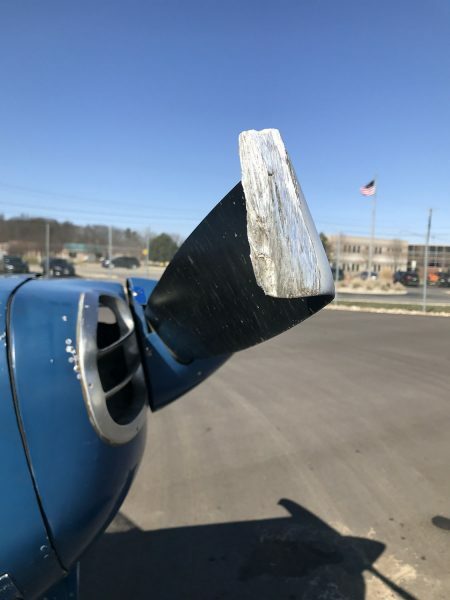 It’s an old plane, it’s a Franklin engine, and it gets a little temperamental with leaded fuel sometimes, so it wasn’t completely out of the ordinary from what I have experienced before. Fortunately, I was close to the airport I was stopping at, and I landed without event. While taxiing in, I did a couple quick magneto checks and got the feeling that it may have just been a sticky valve that was causing the roughness. Not a terribly hard fix, but one that was going to leave me calling my wife for a ride home until I could get a maintenance professional to properly diagnose and fix the issue. I parked the plane, did the practical test, and called my wife for a ride home. This is where my decision-making process started to become complacent. While I waited for her to arrive, I decided to go outside and try to run up the aircraft again and “get more information about what it was doing” so I could pass that information along to the maintenance provider. The plane was parked on the ramp. Not planning on flying anywhere, just doing a little engine run, I left the chocks in place. I know. Bad decision already here. It gets worse. I got in the plane, started it, noticed the same roughness and wanted to see if it continued at higher RPMs, if I switched magnetos, if I tried carburetor heat, or if changing mixture settings had any positive or negative effects. While I did this, I needed both hands to manipulate the throttle and the other controls. That means I didn’t have a hand on the yoke. Another bad decision. I had also failed to notice that while I had done the test earlier, the winds had gone from about 040 degrees at about 4 knots, with a building blocking the winds, to a 160-degree direction, leaving the aircraft pointing straight into gusts that I later noted reported at 24 knots at their peak. While I was “just doing a maintenance run,” I had gotten complacent about considering many of the things I would probably have paid more attention to if I were actually going to be flying. It bit me. While I focused on the engine issue, I didn’t focus on all the other environmental factors that were happening, and while I held the brakes and the main wheels were chocked, suddenly something felt very wrong. I had done hundreds of run-ups like this before and never had a problem, but I had never had all these factors come together at the same time. With a full-power engine runup, a 24-knot gust and a complacent pilot not holding a yoke back, there was enough lift to pick the tail up. It was even enough to have the propeller just barely strike the pavement before the gust settled and, with it, the tail back to the ground. I reduced power as quickly as my mind registered that it needed to be reduced, but it was too late. It happened fast. I felt sick. I was in a little bit of disbelief that it had even happened. A competent and proficient pilot who even just wrote a book about tailwheel flying had allowed this to happen. Uggh. Feeling defeated, I pulled the mixture to cut off, and the engine spun to a stop. Magnetos and master switch off, I climbed out to see the slightly curled tips of the prop on the Stinson. I felt like I had let down a member of our family. I had hurt our airplane through my complacency. Okay, I know there are lots of things I should have done differently here. Not left it chocked, not done the full-power runup into the wind that was now gusting or had the yoke back, had a second person in the plane to help with this process, to name only a few things. But all of those are singular things that could have helped avoid the problem in this situation. The bigger lesson is that just when we think we are doing something simple, something we may do regularly, if we get a little complacent and don’t follow best practices, it can result in pretty negative impacts. A little cutting of corners, even with the best of intentions, can cause us to miss the one factor that will cause any experience we have to become nullified by our disregard for even seemingly unrelated concerns. Thanks to a good maintenance provider, and some expenses, we are well on our way to returning the aircraft to service. But it was a hard reminder for me. Interestingly, but not surprisingly, one of the more common complacency-related problem areas we are starting to see more is related to mobile device or electronics usage. Not unlike when we drive our cars, mobile devices and telephones are equally problematic and distracting to pilots when operating aircraft. These devices are fantastic tools when used for aviation-related tasks such as charting, but when we also use them for other tasks during flight operations, it can lead to problems. More accidents and insurance claims are starting to find pilots who admit they were texting, checking email or other similar activities when something bad happened. The same holds true of new avionics systems as pilots go "heads down" and get "buried in the box." A little complacency of attention can result in taxiing a wing into a hangar door, or clipping a runway light, or a close call with other traffic as you were texting your ride home from the airport instead of looking outside for traffic. Even when an aircraft is on autopilot, our attention should first and foremost be on operating the aircraft. Any break from this attention for non-flying duties really needs to be short or wait until we are back and stopped on the ground. We may be able to get away with some complacent pilotage many times, but all it takes is once to have it end up becoming a much bigger problem. Flying is a technical and demanding occupation or hobby. If we do it right, it can be highly rewarding. If we get complacent, it can cost us dearly monetarily or even physically. As pilots, we can learn from others’ mistakes. I will happily share mine with anyone who wants to learn from them to make themselves safer as a pilot by not repeating the ones I have made. The lesson here? No matter how much we think we are on the top of our game, experience doesn’t trump complacency. Thanks for the excellent story and tips. I had a similar experience but was lucky enough to escape with egg on my face and no damage to the airplane. We pilots are indebted to those of us who tell how to avoid making mistakes. Hope you were able to fix the aircraft and keep flying it. I’m thankful that you shared your experience and allow others like me to learn from your lesson. My wife thinks I’m a bit morbid with how interested I am in learning from others’ mistakes, but I find that reading accounts like this are a less costly and less dangerous way to learn than by making all those mistakes myself.